Chandigarh, March 09, 2017: Renault India, one of the fastest growing automotive brands in India, created history with its Global car for Conquest, Renault Kwid. This Attractive, Innovative and Affordable car, is a true game-changer and volume driver for Renault India, selling more than1,30,000so far. Staying true to its commitment to keep building on the success of Kwid with breakthrough product innovations, Renault launched the new KwidCLIMBER today, at an affordable introductory price of INR 25,000more than the Kwid1.0L SCe (Smart Control efficiency) MT and AMT .With the launch of Kwid CLIMBER, Renault has made a conscious effort to create a vehicle that is a perfect semblance of style and premiumness. The KwidCLIMBER which made its world premiere as a concept vehicle at the biennial Auto Expo 2016 gathered tremendous attention. Designed and developed by Renault’s design studios in Mumbai and Chennai, the CLIMBER demonstrated Renault’s progressive design innovation while underscoring Renault’s commitment to the Indian market. The KwidCLIMBER concept proves the highest degree in which the KWID can be customised. 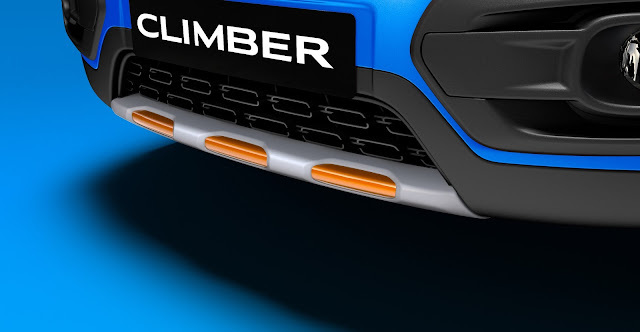 KwidCLIMBER will offer segment leading length, power to weight ratio, boot space, ground clearance and cutting edge technology. It boasts of several first-in-segment features led by its SUV inspired design, 7-inch touchscreen MediaNAV system, digital Instrument cluster, one-touch lane change indicator, radio speed dependent volume control and pro-sense seat belt pretensioners with load limiters. Best-in-class features include its boot capacity of 300 litres, ergo-smart cabin, multiple storage spaces, upper segment body dimensions, interior space, service parts maintenance cost, ride & handling and several personalization options. CLIMBER draws on the DNA of the Kwid to develop its SUV capability to the extreme.At the first glance, CLIMBER’s SUV lines are reflective of its tough, robust character and underpin its distinctive, premium look. As for the exterior, the KwidCLIMBER features rugged bumper overrriders, front and rear terrain protectors with orange accents, two tone arching roof bars,muscular style wheels anda solidside profile with robust door protection cladding, two tone orange ORVMs painted in glossy orange. The ‘Climber’ Insignia on the front doors creates its unique identity. This draws attention to the robust features which have become the Renault Kwid’s hallmark. All these design changes have brought forth a matured overall stance in line with itsall-terrain attitude.With its high ground clearance, wide track this car is built for to turn heads. The interior too boasts of several striking design elements like the new orange energy upholstery with “Climber” Insignia,new vibrant orange accents on the AC vents and on the centre fascia, a two tone orange gear knob and decorative orange door trim accents on the front and rear doors. All these bring an energetic feel to the cabin. Other styling elements include specific floor mats and a chunky steering wheel with “Climber” Insignia. The interior has been crafted with thoughtful design elements in order to complement the vehicle’s stylish exterior. The KwidCLIMBER personifies a new generation urbanite who wants a robust vehicle with more style and panache. The Climber enhances thestyle quotient inside out. The result is a very distinctive personality which suits all types of adventure. 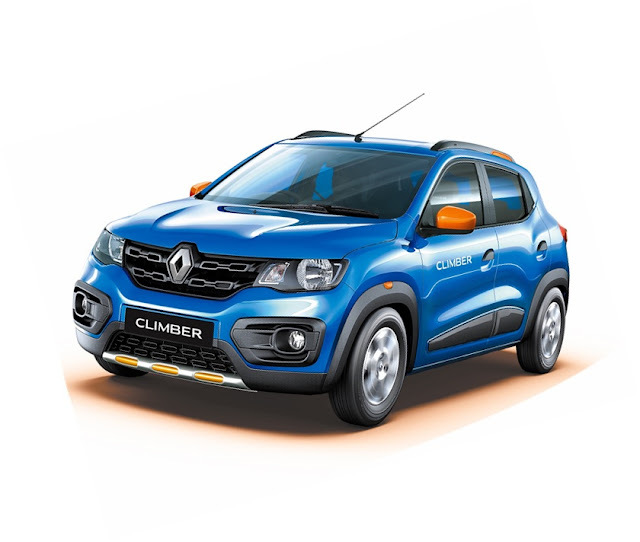 Kwid Climber will add greater diversity to the range, taking forward the positioning of Kwid as a car that enables customers’ to ‘Live For More’. The 1.0 litre SCe engine which powers the Kwid Climber is optimally designed for better performance. The 4 valves per cylinder of the Double Over Head Camshaft (DOHC) layout ensures low pressure drop and super-efficient valve lift for a higher air filling; thus allowing the engine to make usable power at low end, mid-range and high-end rev bands.This high technology engine offers excellent drivability, be it slick city streets or on the highway. Kwid 1.0 MT comes with excellent fuel efficiency of 23.01kmpl(ARAI). TheEasy-R Gear Box isa 5-speed Automated Manual Transmission (AMT) technology derived from Renault’s rich and successful expertise in Formula 1. It will enable a clutch free driving experience that combines the fuel economy and performance of a manual transmission with the convenience of automated gear shifting. The Innovative Shift Control Dial with three modes Reverse – Neutral –Drive has been smartly designed for ease of use. An advanced control unit automatically optimizes gear shifting in accordance with driving conditions for smooth and regular acceleration to offer a comfortable and stress-free driving experience. Kwid 1.0 AMT comes with excellent fuel efficiency of 24.04kmpl(ARAI). Safety is of paramount importance for Renault, and all its products meet and exceed the requisite safety standards set by the Indian regulatory authorities. Apart from several active and passive safety equipment, Kwid CLIMBER features a driver airbag and first-in-class pro-sense seat belts - pre-tensioners with load limiters an important safety feature that is usually offered in upper segment cars as standard. “Our roadmap for India is very clear, with an immediate goal of achieving a market share of 5% in the near-term. 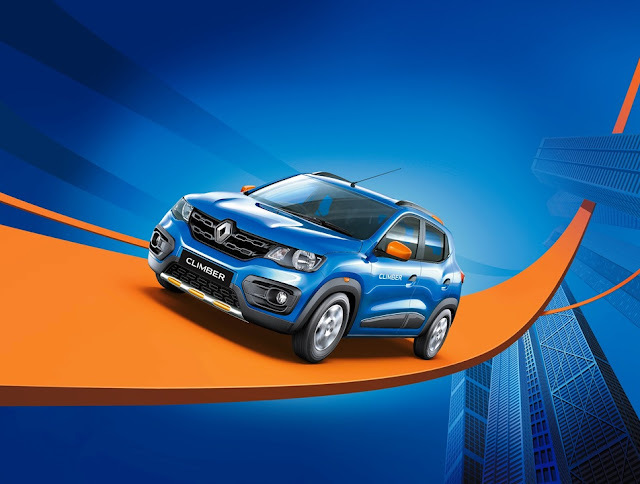 We will continue with our product offensive strategy in India, as is reflected by the Kwid Climber launch, to substantially grow the Renault brand in India.With this launch, we look forward to welcoming more customers into the Renault family as we endeavour to aggressively consolidate our presence in India.These efforts are accentuated by a clear strategy to enhance the customer brand experience, with several unique and pioneering initiatives already underway to ensure that customers have an unmatched and superlative association with the Renault brand,” concluded Mr. Sawhney. The KwidCLIMBERwill be available over the top-end 1.0L RXT (O) variant in manual transmission with three exciting colour options- ElectricBlue - Exclusive Shade, Outback Bronze and Planet Grey. Bookings have commenced across all Renault dealerships in India. Bookings can be made either at the dealerships or through the Kwid App, which could be easily downloaded from the Google Playstore or Apple Store. Renault India’s product line up and services have seen strong recognition among customers and industry experts alike, winning more than 60 titles, including 31 accolades for Duster as well as awards for Pulse and Scala, making Renault India one of the most awarded automotive brands in a single year in India. The Renault KWID has already bagged 31 awards, which include 10 ‘Car of the Year’ Awards.